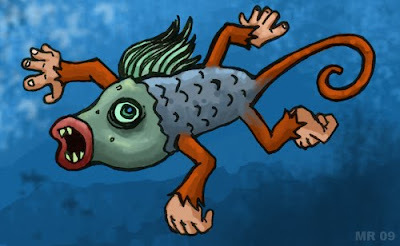 Strange aquatic simians, Fishmonkeys live in the deep seas. They are notable for seemingly appearing overnight - one day from out of nowhere thousands of schools of the bizarre mutant just appeared out of nowhere, with no prior sightings or evidence in the fossil record. This has lead many to speculate they are extraterrestrial in origin.